This month's host of the foodie blogging event Is My Blog Burning? is Linda, who writes one of my favorites blogs: At Our Table. The theme is very wide, so I bet there'll be lots of participants: "Summer's Flying - Let's Get Frying!" I was kind of planning to do something elaborate - maybe using my new deep-fryer! But.. well, that didn't happen. As so often, life snuck up on me and reminded me that I had a very busy week as it was. No time to dig up an exciting new recipe to try! So, instead, I opted for an eternal Swedish (or probably Scandinavian, Oslo Foodie has posted that she eats this too) favorite. 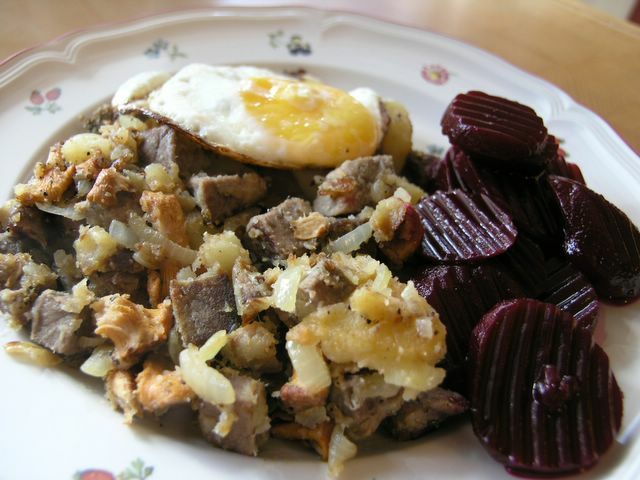 Something probably eaten in most Swedish households at least once a month - Pyttipanna. This is the Swedish version of stir-fry, so to speak. And to put it bluntly, it's all about the leftovers. You can buy this ready-made and frozen, and just fry it. And sure, that's good. Real good, if you add some mushrooms, maybe a dash of cream.. mm. Good stuff. But for this, I wanted to make it from scratch. Besides, I had a huge big piece of roast, just begging to be cut up and put into the pan with some potatoes and onions. See, potatoes, onions and meat are the staples here. Without them, no pyttipanna. (Although some insist on veggie versions.) Then you can add whatever you want - more veggies, other types of meat - bacon is good - like I mentioned, cream, seasonings.. anything really. Anything that you have in the fridge, that is. All about leftovers! So. I'm not even going to give a real recipe. But for the pyttipanna in the picture, I used about 300 g of roast, diced, 1 yellow onion, coarsely chopped, 5 medium potatoes, boiled and diced, and - the pièce the résistance - about 200 g of golden chanterelles. Start by frying the potatoes until they're lightly golden. Add the meat and the onions, frying until the onions start getting translucent and soft. Add the chanterelles, and let everything be heated through. Always serve with a fried egg, and always ALWAYS have pickled beets with it. That's just the way it is. No changing that one - at least not for me! Golden chantarelles is just fantastic to add to a classic Pyttipanna. And dont forget the luxury version of pytt: Biff Rydberg. Or maybe a Biff Rydberg with golden chantarelles - wow! I can never resist "pyttipanna" when I am in Sweden, it's really more of a Swedish thing and they make it best too! I love mine with plenty of pickled beets and quivering egg... delicious. Sounds good, Anne. You can't go wrong with such a practical, easy and, above all, tasty dish! Ahhh! Very interesting presentation. This is my first time hearing of pyttipanna. I like all the ingredients. Very appetizing. This was just what I was looking for! I lived in Stockholm for 6 months in 1987 and I've never gotten over it. Especially the food. I first enjoyed Biff Rydberg, and when I carried on a friend said, "You would love pyttipanna, Biff Rydberg's poor cousin!" He was right. Thanks for bringing me a wonderful memory! Anne, it never matters how long I've been away, or when i log on, there is always something truly delicious being served at your house. Yum!